1.How do I know that I am buying a quality product? We have spent a lot of time researching the products we offer. In addition, we are in constant contact with our existing customers, ensuring that every purchase exceeds expectations. We refuse to sell lower quality furniture, similar to that found in large box stores. We try to include as much information as possible about each product and brand listed on our website. If you have any questions about a specific product, please feel free to email or call our Customer Service and we will be happy to get them answered! 2.How do I find you? If you have questions about our products, a previous order or if you just want to say hello, please use thecontact form below to contact us and we will get back to you as soon as possible. 1. How long does it take to ship my order? Shipping times vary dependent on the product, manufacturer and your location. General you can receive the goods in 3 to 7 days. Shipping is FREE to addresses in the continental United States! We are proud of the savings we are able to pass on to our customers with this great offer! 3.Where will my order ship from? Our furniture ships to you direct from the manufacturer. This saves warehousing costs and allows us to pass the savings on to you! As a result, our furniture ships from a number of different facilities around the country. 4.Will the delivery man leave my order on the porch when it's delivered? Smaller parcel orders will be shipped UPS and FedEx. In such a case, the driver may leave your package at your residence. However, the majority of our orders ship common carrier due to their size. In such an instance, the shipper will call ahead to arrange delivery to your location. Someone will need to be available to sign for the delivery. We accept credit cards (Visa, MasterCard, American Express), PayPal and Amazon Pay. 2.When is my credit card charged? Your credit card is charged at the placement of your order. Keep in mind that this charge occurs, in some instances, a week or two before the product actually ships. The credit card charges are applied upfront because many order require custom options (fabric for cushions, or arrangement on palettes for shipping) that necessitate payment at the time of order. Orders that are paid via PayPal, Check, or Amazon checkout also require payment at the time of order placement. For your financial safety and security, we NEVER store your credit card information. 1.What if I don't like what I purchased? We understand that purchasing patio furniture online can be difficult, since you cannot touch or feel the product. We understand this difficulty and work extensively with our customers to ensure customer satisfaction. If you are not satisfied with any purchased item, simply ship it back to us and we will credit you the amount of the purchased item minus our original shipping cost. You can send back anything you are not satisfied with, no matter what the reason. Please see our Returns page for details. 2. What if my order arrives damaged? We will gladly replace the item or refund your payment. We will bear the cost of shipping the item back to us for replacement. Please contact our customer service team to help you. Email: cs@sundaleoutdoor.com Show your order number and damaged photos to us. 3.How do I repackage my return? After calling us to process a return and get you an RMA number, you will need to prepare your item for shipment. Please repack the item to be returned securely in the original packaging. Please write your RMA number in large characters on the outside of the box. Make sure the package is fully sealed before shipping. We are not responsible for packages that are lost or damaged. Please see Returns Information for complete details. 1. Is my patio umbrella built to shelter me from the rain? No, patio umbrellas are built to shelter from the sun’s harmful UV rays. Although they are water resistant, patio umbrellas should not be left open during inclement weather. 2. How do I clean my umbrella? Start with a damp cloth to wipe down excess dust and dirt on the ribs and canopy. This will take off most if not all dirt. If dirt and blemishes persist, use soapy warm water and clean cloth. A hose will also work great for a quick clean. Stay clear of using any abrasive materials and harsh cleaning chemicals, as these cleaning agents could potentially damage your umbrella. To prolong your umbrella’s beautiful look, be sure to clean it before storing, especially for the winter or any extended period. Mud and debris left on a canopy over time become embedded in the fiber of the umbrella, creating mildew. 3. Can I use my umbrella in the winter? Absolutely! You can still enjoy your patio when it is cold out. Patio umbrellas are a great way to help stay warm while you enjoy your patio in the cooler months. A patio umbrella prevents heat from escaping upward, leaving the air under the umbrella warmer than the surrounding air. A canopy umbrella heater can strengthen this effect. This infrared heater is designed to vent heat downward from underneath the umbrella canopy. 4. What size umbrella do I want? This depends upon how much shade you are looking for. Generally, Patio Umbrellas are measured by their canopy diameter, but this can differ by manufacturer. To be on the safe side, you would want your umbrella’s canopy to be at least 3 ft larger than the area to be shaded. Consider this table below. 5.How do I know what size base I need? If you plan on utilizing your umbrella through a table take that into consideration as an umbrella through a table is sturdier than a free standing umbrella thus needing less base weight. 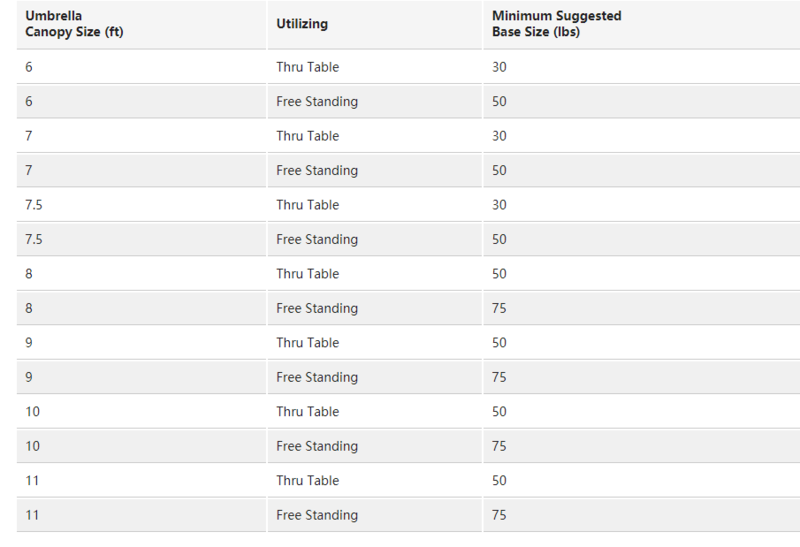 The table below is a minimum suggested base size chart. If you live in an area where strong winds are a frequent occurrence you should consider going with the next heavier weight up. •20 lb. Base – Used for smaller table umbrellas. Only suitable for 6′ table umbrellas. •30 lb Base – Used for 6.5′ table umbrellas. •40 lb Base – Minimum weight for free standing umbrellas up to 4.5′. Can be used for table umbrellas up to 7.5′. •50 lb Base – Accommodates up to 7.5′ free standing outdoor umbrellas. Can also be used for table umbrellas up to 9′. •70+ lb Base – These bases can be used for most free standing umbrellas up to 11′. If you live in areas that experience high winds, you should consider a commercial cantilever outdoor umbrella. 7. Will my patio umbrella fade? Yes, but only gradually after years of exposure to direct sunlight. Most manufacturers offer at least a 1-year warranty against fading. Higher grade fabrics, offer 3- and 5-year warranties, respectively. 8. Can my patio umbrella stay outside during the whole summer? Your patio umbrella can stay outside during the whole summer without any problems. When there are upcoming strong winds it is advisable to close the sun shade or to dismantle it completely if necessary. 9. Are there spare parts available for my patio umbrella? No, we don’t sell spare parts or replacement. We only sell completed patio umbrellas. Write an e-mail, we´ll happy to assist you. 10. Do you make repairs? No, but if there is a problem with something you purchased, let us know and we will take care of it. 11. What UV % will this umbrella block? This depends upon the canopy fabric. Most fabrics will provide 90% UV protection or greater. When enjoying your patio umbrella be sure to take into consideration reflection from the ground or nearby water as this UV source will be coming from the ground up, and will not be blocked by your umbrella. This solar LED patio umbrella perfects for picnics, camping, playgrounds or any outdoor space. It not only can provides plenty of shade keeps you cool on hot summer days but also built-in twinkling lights create romantic lighting in the evening. Let your families or friends enjoy yourselves at anytime. The solar panel provides a glowing light that lasts 9-12 hours and the LED lights will provide about 15,000 hours of use. This umbrella also features a solid resin hub, push button coupling and plastic housing for durability and ease. 13. What is a market umbrella? A market umbrella is a style of patio umbrella that would closely resemble a hand held umbrella that would be used in the rain. Market umbrellas have a pole in the middle of the canopy for support and do not have an overhang or valance around the edge of the umbrella. 14. What is an offset or cantilever patio umbrella? Offset or cantilever umbrellas support a hanging canopy from above, with the umbrella pole to the side -- meaning there is no pole in the middle of the shade. This design makes the offset umbrella unique, popular, and versatile. Sitting under an offset umbrella is not much different than sitting under an awning or covered porch, because of the lack of a center pole. It would be ideal for shading a table without an umbrella hole, a hot tub, or portion of your pool. It can also easily rotate to provide shade as the sun moves during the day. If you live in area where high winds are frequent, this might not be the best choice for you, as their design makes them more vulnerable to gusts. Be sure to secure your offset patio umbrella with a heavy base, or fasten it to the ground. Offset umbrellas require more base weight than freestanding umbrellas, and tend to be a bit pricier. 15. What is push button patio umbrella? The term “Push Button Tilt” can be a bit deceptive. When the button is pushed, the umbrella ribs will unlock, giving you the ability to tilt the canopy to the desired position. A drawback of the push button design is that there are only 2 or 3 pivotal points offered. 16. What is the difference between umbrella fabrics? When considering a fabric, keep in mind your intended usage, storage and application. If you plan on using your umbrella year round, commercially, or just want to extend the life your umbrella, durable fabrics are ideal. If you plan on storing your umbrella during the winter or periods of disuse, consider a thinner, less expensive fabric, such as spun polyester. •Solution-dyed to retain fiber built to retain color and vibrancy. 17. What pole or frame material should I use? Aluminum patio umbrellas have a sleek modern vibe that complements minimalist decor and wide open spaces. This alloy is inexpensive, lightweight and durable, which make it a great choice for outdoor shades. Most aluminum frames are powder-coated or anodized to resist corrosion and other signs of wear. Aluminum is inherently malleable and strong, so it can be shaped into extremely dynamic and interesting shapes that wood cannot attain. It also comes in a wide variety of finishes, which helps it coordinate with other furniture pieces. Aluminum will not break in high winds, although it can warp after prolonged exposure over a long period of time. Aluminum frames and poles also tend to offer many features, such as crank lifts and tilting. Outdoor umbrellas with fiberglass poles and frames are among the most durable on the market. Fiberglass is lightweight, strong and far more flexible than wood or aluminum. This flexibility allows it to bend without breaking, in even the most severe wind storms. Additionally, fiberglass does not rust or rot, so it even performs well in wet conditions. While it tends to be more expensive than the other material options, its ability to withstand extreme weather conditions for years make it a strong investment in the long run. Fiberglass umbrellas are available in a variety of colors, which helps them blend into any outdoor color palette. Many modern patio umbrellas pair fiberglass ribs with aluminum poles to reap the benefits of both materials. Tilt and crank lift features are also available on most fiberglass umbrellas. 18. How long will the battery hold a charge? The 2000 mah Lithium Ion built in battery will hold its charge for 100 hours without sunlight. 19.Is there a continuous charge when in direct sunlight? While the umbrella is in the sun, the battery is constantly charging to allow the consumers devices uninterrupted charging. 20. How long can the LED lights stay on when the sun is not shining? The LED lights can stay on for 100 hours when the built in 2000mah Lithium Ion battery is fully charged. 21. Can the Umbrellas be charged and used indoors? Our umbrellas are great for power outages during or after storms and disasters which is a very important safety feature as communication is key during times of disaster. You can lean the umbrella against your window from inside your house and it will charge the battery, which will allow the consumer to continue using and charging their devices in times of need. 1. What are the advantages/disadvantages to a quilted fabric hammock compared to one of your rope hammocks? There’s nothing better or worse about fabric vs. rope; it really comes down to your own personal needs, and personal preference. Fabric: The rich, colorful designs of our fabric hammocks offer tremendous possibilities for embellishing the looks of some chosen corner of your yard. Fabric hammocks, with their inherently more-restricted airflow, are particularly appropriate if you’re planning to use your hammock beyond the warm days of summer. OurQuilted Hammocks, woven from two layers of cotton-soft all-weather fabric, with a center of plush polyester fiberfill batting, are heavier and thicker, with a pillowy surface. Rope: With their double-latch weave resembling lattice, our rope hammocks allow airflow far beyond what’s possible even with a single-layer fabric hammock, making them potentially cooler to recline in. When hand-woven from suchmaterials as soft-spun polyester,rope hammocks now have the potential to last indefinitely, and with minimal care, unlike with cotton rope, once the hammock-rope standard. 2. How much space do I need for hanging my hammock? The ideal distance for hanging a hammock typically averages out to roughly 2 feet greater than the hammock’s total length from ring to ring. It’s best to plan on needing about 15 feet of open space to hang your hammock, though in reality, the actual distance tends to vary anywhere from 13-16 feet. A good rule of thumb: The closer you set your hanging points, the greater the curve, or arc, your hammock will have once it’s hung. your hammock such a pronounced arc as to be uncomfortable. * Distance measured from ring to ring when hammock is laid flat on the floor. times the hammock is used. 3. What’s the weight capacity of a Sundale Outdoor Hammock? All of our hammocks are designed to hold up to 450 pounds. (For our hammock swings, hammock stands and swing stands, the weight capacity varies by product, from 350-600 pounds. To find out those specific weight limits, please consult individual product details at this site, or the original instruction sheet that accompanied your Sundale outdoor Hammocks product when you first bought it. 4. Can I leave my hammock or hammock swing out in the rain? Even with a qualitymaterial like our Cotton Rope Double Hammock the less long-term weather exposure, the longer the product will ultimately last. That said, you hardly need to race out and take down your hammock or hammock swing every time you get a little rain! However, during lengthy periods of rain or stretches of extreme weather when you obviously aren’t going to be outside enjoying your highly crafted relaxation station, bringing it indoors will only stand to lengthen its useful life. 5. How long can I expect my hammock to last? If it’s a Sundale outdoor hammock , we guarantee that you’ll automatically be getting a lot more useful life out of it than you would with most other brands. But putting a specific time on this is tough. Care and maintenance of a hammock, along with the materials from which it is crafted and the climate conditions where you live, all tremendously affect how long it will ultimately last. Because it’s constructed of materials designed to yield a longer life, your hammock may last indefinitely if routinely cleaned and cared for, and also taken down and stored during the outdoor-unfriendly winter months and other protracted periods of bad weather. 6. How do I care for the fabric in my fabric hammock? As a general rule, don’t allow yard debris such as leaves, sticks, pinecones, grass clippings, etc., to accumulate in your hammock. Beyond that, periodic washing of the fabric is your best bet. We do not, however, recommend that you attempt to take your hammock apart to clean it, or ever machine-wash or machine-dry the fabric. Sundale outdoor quilted fabrics – Light spot-cleaning is generally best. Cleaning too vigorously can cause the polyester fiberfill batting to bunch up, and it’s not always easy to work it to back to its original shape. If you have to resort to more intensive cleaning, lay the hammock flat on a clean deck or concrete surface, then carefully wash with a mild soap-and-water solution and a soft-bristled scrub brush, rinsing thoroughly with a hose. Flip the hammock and clean the reverse side if needed. Hang your hammock back up to let it air-dry before using again. For cleaning problem areas, a store-bought spot-remover is fine to use, following its package instructions. 7. How do I hang my hammock? •You’ll want a hanging space that’s between 18-24 inches greater than the total length of your hammock when measured from ring to ring. A good rule of thumb: The closer you set your hanging points, the more curved your hammock is going to be. •Choose wood for installing your hanging hooks that’s at least 6 inches in diameter, and strong. Hardwoods such as oak, hickory, etc., will support you and your hammock far better than will softwoods like willow, palm and beech. •To install hanging hooks in a tree or other wooden surface, drill a 1/8 inch-3/16 inch pilot hole (the smaller the better). After starting the hook in the hole by hand, grip the hook eye with a wrench or thread the hook eye with a screwdriver to twist all the way in. Stop when the eye makes contact with wood; twisting past that point can damage the metal and ultimately weaken support. •To now actually hang your hammock, hook each of its chains onto one of your newly installed hammock hooks, using the chain links to adjust height and tautness. Don’t worry if the hammock seems a bit tight and difficult to lie in right after you first hang it; after some use, it will loosen and stretch to its full length. As your hammock stretches, you’ll probably need to shorten or lengthen its chains to get your desired hanging height. It’s typical to have to tweak the height a couple of times. 8. Will I hurt my trees if I hang my hammock with tree hooks? Installing tree hooks shouldn’t affect the health of your trees, though if you ever plan to remove the hooks, be aware that they’ll leave behind permanent holes. All-weather tree straps present a simple alternative, since no drilling is necessary, and tree straps also allow for easily changing hammock height, or even hammock location, at any time. 9. My stand has a little bit of a wobble; should I be concerned? No, a little wobble is actually to be expected! We manufacture our stands this way to allow for the natural swaying motion that’s part of the joy of any quality hammock or swing. Wicker is best described as anything that is woven. Natural wicker can be made from rattan or any wood type products that are small and easily woven. These are usually woven on rattan frame. Synthetic wicker made from resins and woven on aluminum frames is also available allowing this wicker to be used totally outdoors. 2. What kinds of materials are used in the product? Rattan or natural wicker furniture can last for years. If used indoors, it is not unusual for it to last 20 - 30 years +. Cushions last from 5 - 15 years depending on usage and exposure and can be easily replaced. Synthetic wicker also will last for many years and its cushions can also be replaced. 4. Can I use this furniture outdoors? Since the 1800's, wicker furniture has adorned the front porches of America's finest homes. Wicker Furniture can be used in any covered area. If you wish to have extra protection from the elements or to use the furniture in an uncovered area, you should choose synthetic wicker or resin wicker furniture. 5. I would like to put a wicker set in my screened-in porch; however it can get very cold/hot. Will the temperature have any effect on the wicker? Wicker furniture is not adversely affected by either cold or hot temperature. In our more than twenty years in business, we have warehoused wicker furniture in areas without climate control, and have observed no negative effects on the furniture. 6. Do I have to put the furniture together? All furniture is fully assembled and put together unless otherwise noted. All you need to do is take the furniture out of the boxes and enjoy it! 7. How do I care for wicker furniture? In order for wicker patio furniture to remain in good condition, it is essential to clean it regularly. Because it is subjected to outside elements, the furniture needs to be wiped and dusted more often than indoor furnishings do. Owners should clean spills up immediately so that they do not get embedded in the wicker. Wicker can be gently wiped with a soft cloth soaked in a gentle dish detergent and water solution to effectively remove dirt and dust from the surfaces and crevices of the furniture. Using large amounts of water throughout the cleaning process should be kept at a minimum to avoid potential water damage. It can also be refreshed with a new coat of paint, followed by a coat of sealant or shellac. When not in use, wicker patio furniture should be kept out of direct sunlight. Although wicker material does well in humid conditions, it is important to limit sun exposure in order to preserve the life of the furniture. Large amounts of sunlight can cause dry rot and severely reduce the look and function of the furniture. We offer two wicker color options – Black and Mixed Brown. Black option is hand woven with a single shade of black wicker for uniformed appearance. The wicker is smooth to the touch which adds to the contemporary and modern aesthetics. Mixed Brown option is hand woven with multiple shades of brown – caramel, brown and espresso brown – to yield a beautiful, multi-tonal appearance. The wicker is slightly textured which adds to the sophisticated aesthetics. 9. Can I paint the wicker? 10. What should I be aware of when buying wicker furniture? There is a lot of wicker furniture available. The far majority is inexpensivly made and is therefore offered with an inexpensive price. Most of what is inexpensive because quality is not built into this furniture, therefore with less quality you should expect that this furniture will quickly become less attractive and have issues fairly quickly.For nice quality made rattan wicker furniture, look for well known furniture brands/manufacturers.